At Lifetime Shutters we are 100% focused on our customers’ expectations – and then we strive to exceed them every time. Over the last 12 years Lifetime Shutters has become a major force in the shutter and window industry in the UK because we are totally customer-driven. 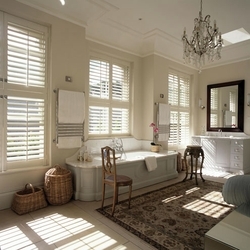 We listen to your ideas and we design your plantation shutters in exactly the way that you envisage them. Then they are hand-crafted in our workshops using traditional methods, but also employing every new innovation in shutter and window production. Quality and customer satisfaction are everything to us, and to that end every stage of the production process is subject to quality control checks. Indeed, before your shutters are allowed to leave our workshops they will have undergone no less than 25 quality control checks. This ensures that your shutters and windows will be nothing short of perfect, and will last a lifetime. All of our craftsmen are exactly that – craftsmen. They take a very great pride in what they do, so attention to every last tiny detail is their mantra. That begins with selecting premium hardwoods from a small and exclusive number of UK timber merchants. Only the best will do for Lifetime Plantation Shutters customers. Combine that with precision mortise-and-tenon joinery, hand finishing at every stage, and prescription wood conditioning and we then have a recipe for shutters of which we can be proud, and which we are happy to stand behind with our limited lifetime warranty. 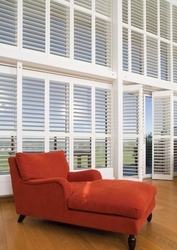 Lifetime Plantation Shutters produces shutters of the finest quality for discriminating homeowners. Our Sussex Wooden Plantation Shutters are hand-crafted from only the finest basswood and other hardwoods selected by our own buyer from a small handful of trusted UK timber importers. We will not purchase timbers from general importers, nor be enticed by their “deal of the week”. Lifetime Plantation Shutters customers get only the finest timbers available. Our shutters are an investment that will appreciate with time so that our customers not only enjoy the sheer beauty of their plantation shutters but will also obtain a return on their investment should they wish to sell their property at some point in the future. Our craftsmen take great pride in their work, and use traditional skills of furniture design and production that have been handed down through the centuries, combined with the latest innovative technological developments. 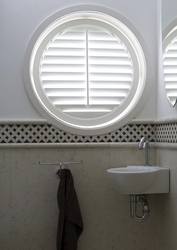 Every shutter that we produce is designed to fit your window and complement your home in a way that no competitor can. For that unique final touch, choose your own frame and panel designs, and select from a wide range of colours to suit your room and your windows. Lifetime Plantation Shutters are offered at differing price levels depending on design intricacy required by the customer and materials selected. 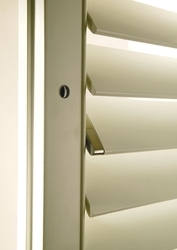 Whatever type of shutter you require, you can be certain that it will be produced to a standard unmatched by any competitor and will enhance the value of your home. All Lifetime Shutters are covered by our limited lifetime limited warranty. Not all timbers are the same. The very best heirloom furniture is made using quarter-sawn wood. So are Lifetime Plantation Shutters. Quarter sawing is a process whereby the logs are first quartered lengthwise and each quarter is then tipped up on its’ point and cut along its’ axis. The result is timbers with the annual growth rings most perpendicular to the faces, which gives straight striped grain lines and greater stability than flat-sawn wood. The wood is much less susceptible to cupping, twisting, or warping. 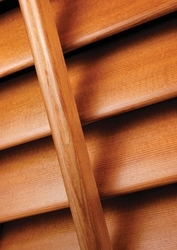 Another important feature of Lifetime Plantation Shutters is the use of the correct joints. We use mortice-and-tenon joints that are designed to cope with the stresses endured by shutters. Every piece of wood that is used is subject to a series of sanding with progressively finer grades of sandpaper: this process opens the pores of the wood and smooths the surface. 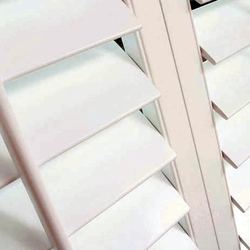 Each shutter layer is coated with a fine quality stain or paint which is what achieves the deep translucent finish of our Lifetime Plantation Shutters. It is labour-intensive but the only way to achieve the finish that our customers deserve. Traditionalists though we are, we constantly seek to adopt any new technology which can result in better performance for our customers. Our aim is to offer every customer the widest possible choice of shapes, frames, colours, materials, and other options. Our Prescription Wood Conditioning technique is unique to Lifetime Shutters. No other manufacturer that we know of does this. It involves our wood conditioning specialists visiting your home or other location in order to determine the average humidity. The wood that is to be used for your plantation shutters is then carefully dried to match that exact humidity. This ensures that your plantation shutters will close tightly and without any gaps and will remain that way for your lifetime. Wood has a tendency to deform, but we overcome this by using a combination of reinforced wood stiles with multiple layers that are bonded with heat, pressure, and a proprietary chemical. The resulting shutters are superior to any alternative. It is not just our outstanding attention to detail at every stage of the manufacturing process that makes Lifetime Plantation Shutters stand out from the crowd. Our service ensures that your shutters are ready when we say they will be and our in-house installation teams are all part of the Lifetime Plantation Shutters family. They will leave your room clean and tidy, and you overjoyed with your new shutters! Any possible shape of shutters supplied, many with operable louvers and panels that open so that you can access the windows for cleaning. 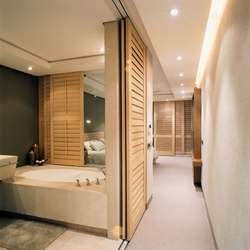 Wooden shutters with a track system for sliding shutters. French door cut-out shutters with handle and doorknob access. Speciality shapes that can combine with rectangular windows.